Deep cleaning never promises an easy approach. Hoovering does not require moving furniture, while carpet cleaning means you need to move your furniture or remove it from the room entirely. And the most disappointing thing is that you have to wait a considerably long time for fabrics to dry before you start putting everything back into its original order. It is not a surprise that you rarely have the desire to tackle this “fantastic” procedure of cleaning carpets in your house. It could have been the end of the world to people who adore tidiness on an everyday basis. But a world that suggests misery can be avoided even in terms of carpet cleaning. See if this fits you as well. Have you ever tried to clean your carpet with a powder? Powders are tried and tested carpet cleaning products! You can use SMELLEZE™ Carpet Deodorizing Powder and it will do the job remarkably well. All you have to do is to scatter it all over the carpet and leave for at least 30 minutes for it to extract the stains and kill the odours. It is advisable to leave it for more than half an hour, if you can afford it. Once you have given it a time to do its work, simply vacuum up the powder and smell the difference. Hair is rarely compared to rugs, but the same ingredients can be used to make them both clean. Next time you buy shampoo for your hair, visit a different section of the store and get one for your carpets too. There are many brands of carpet shampoos, just like of the hair ones. So read the guidelines before you make a choice. Most of them need to be mixed with water. Spill enough shampoo to cover the whole carpet area. Make sure you do not drown your carpet with shampoo, because it will prolong the drying process. Then take a brush and scrub the carpet. Once you are finished, let it dry and vacuum the shampoo from the carpet. These tactics do not mean that you can just try using a bar of soap melted in water to clean your carpets. 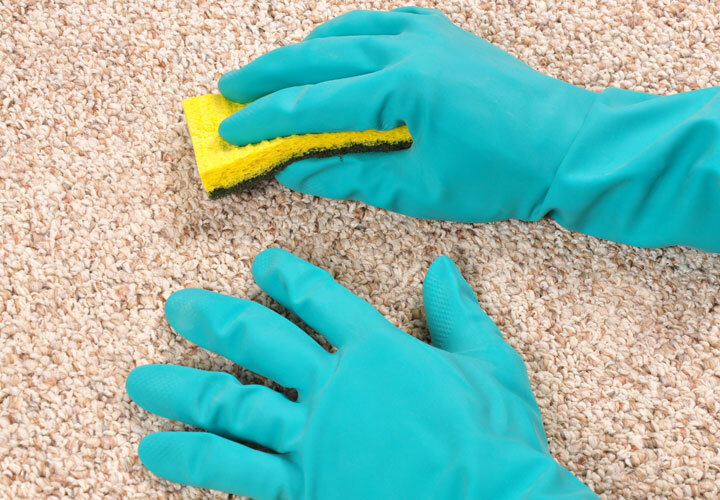 If your carpet is heavily damaged by stains and dirt, your choice would still be a dedicated carpet powder. This will get everything cleaned and dry quickly, while the choice of carpet shampoo will make you wait until the carpet gets dry. Plus, powders get vacuumed easier than shampoo and still do a great job. Whatever method and ingredient you choose, follow the instructions. Otherwise your rug may be damaged and you might even have to throw it away. If you still prefer natural cleaning products, like soda or tonic water, make sure you test the product on a small area first before starting the deep clean. Salt can also be used for removing dirt. Again, it is up to you to choose the right product. Regular maintenance of your carpet will help to avoid deep cleaning. Do not let stains dry into the carpet and remove them as soon as possible. But do not try hard to wipe them out – they will only get deeper into the fabrics – blot them instead. If you are trying to get rid of smelly stains, use a cloth moistened with ODOREZE™ Natural Carpet Cleaner. Sticky stains need to become more solid before they can be removed. If you apply some common sense and these steps, you might get your stain-free carpets back. Good luck with cleaning!